Mew Gull. Seattle, Washington. 03 January 2012. It's obvious that this bird isn't an adult due to the black markings on the tail and primary coverts. The small bill and overall compact proportions immediately steer us into the Ring-billed/Common/Mew Gull arena. In that case this would be a 2nd cycle type as these are 3 year gulls. 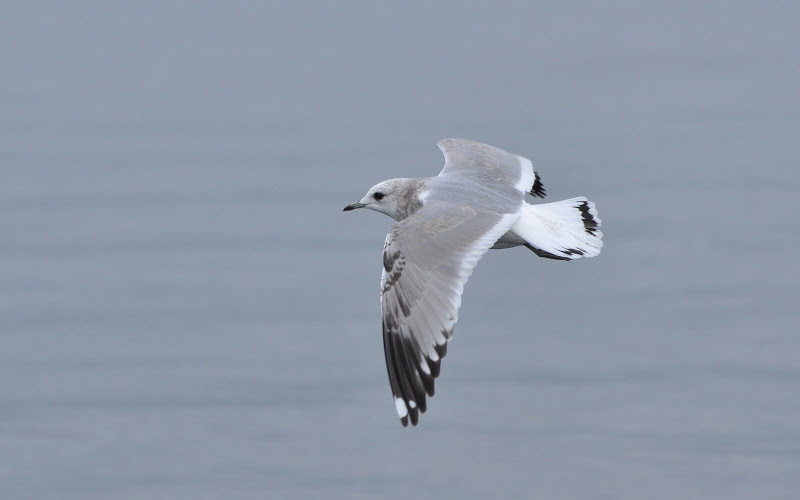 Anyone familiar with 2nd cycle Ring-billed Gulls will find the large p10 mirror to be unusual for that species, but much more problematic is the mirror on p9 - this isn't found in 2nd cycle type Ring-billeds. If the color of the upperparts, particularly the back, is true-to-life, then this too should raise doubts about Ring-billed. Ring-billeds generally look paler and more silvery than this flat, dark, gray. A single mirror on p10 and thinner trailing edge to the secondaries. Given the noticeably thin, petite bill, with large, dark doe-eye, and smudgy hindneck markings, I safely identified this as a Mew Gull (L.c. brachyrhynchus).